Wednesday 27th June 2018 – 10.45am – Murray MacGregor. A motorcyclist has suffered potentially serious injuries after a collision with a car. It happened at about 6.55pm on Tuesday evening outside The Swan pub on Droitwich Rd in Martin Hussingtree between Worcester and Droitwich. Two ambulances, a paramedic officer and the MERIT trauma doctor and critical care paramedic were sent to the scene. A West Midlands Ambulance Service spokesman said: “A nurse who was on scene told ambulance staff that the rider had initially been unconscious. “He was assessed at the scene and treated for multiple injuries. He was given strong pain relief and had his wounds dressed before he was taken on blue lights by ambulance to the major trauma centre at Queen Elizabeth Hospital Birmingham; the doctor and critical care paramedic travelled with the crew. Wednesday 27th June 2018 – 9.35am – Murray MacGregor. 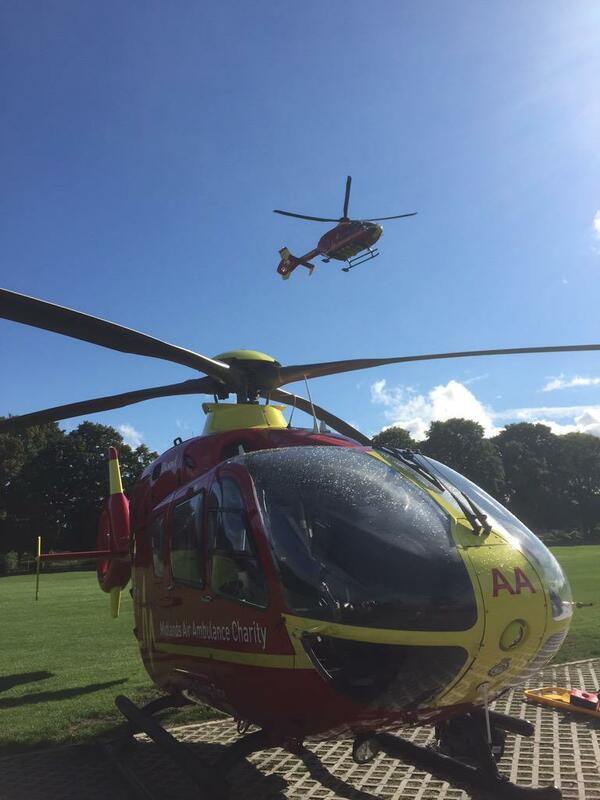 A motorcyclist has been airlifted to a major trauma centre after suffering potentially serious injuries after a collision with a 4×4 vehicle. It happened at about 5.20pm in Rye Street in the Birtsmorton area of South Worcestershire. An ambulance, a paramedic officer and the Midlands Air Ambulance from Strensham were initially sent. An ambulance from South Western Ambulance Service also attended. A West Midlands Ambulance Service spokesman said: “On arrival ambulance staff found a motorcycle that was badly damaged; the fuel tank had split after the collision with the side of the 4×4 vehicle. 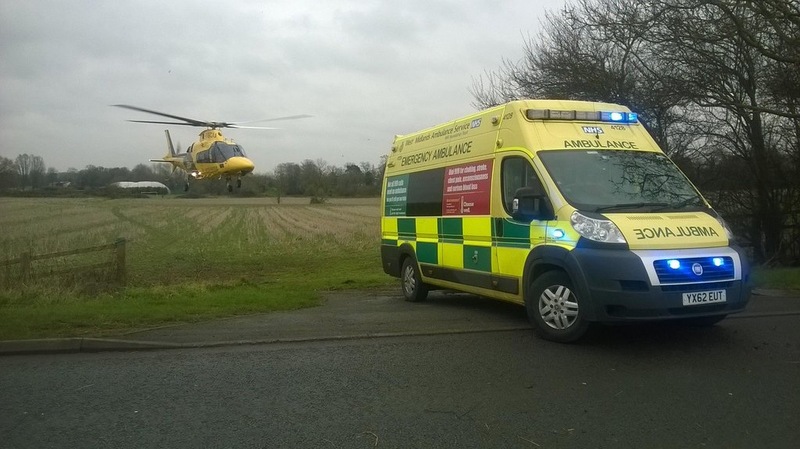 “After an initial assessment of the patient, the crews requested a doctor be sent to the scene so the Midlands Air Ambulance from Cosford was also dispatched. “The rider, who is in his 40s, had suffered multiple injuries. His had a splint applied, was immobilised and given pain relief before being airlifted to the major trauma centre at Queen Elizabeth Hospital Birmingham. Tuesday 26th June 2018 – 12:50pm – Murray MacGregor. The search for the missing 13-year-old boy at Westport Lake, Stoke-on-Trent is continuing. 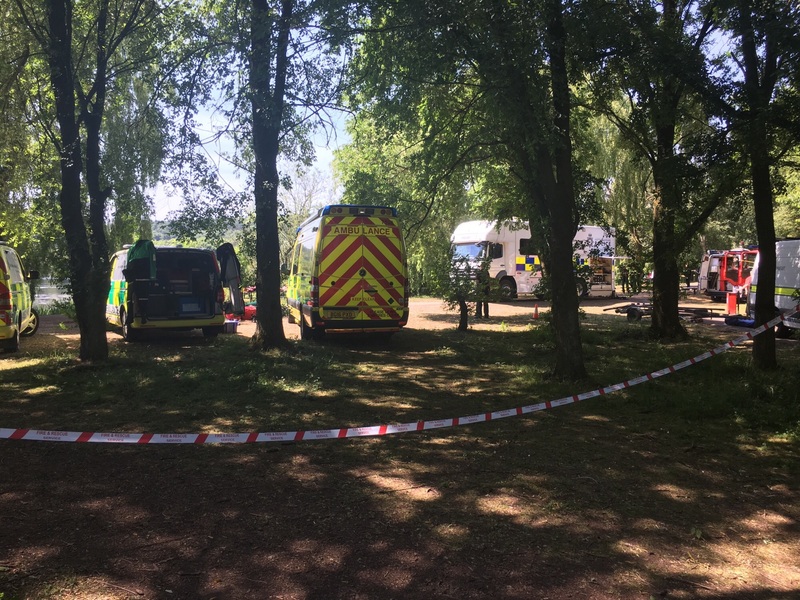 Teams from West Midlands Ambulance Service, Staffordshire Police, Nottinghamshire Police specialist dive team and Staffordshire Fire and Rescue Service are continuing to work together to search the area. Our Hazardous Area Response Team are using dry suits and boats to search the banks of the lake. The family of the missing teenager continue to be supported by family liaison officers from Staffordshire Police. Two other boys, aged 12 and 13, made it safely out of the lake and were not injured. Monday 25th June – 11.45pm – Murray MacGregor. Sadly, all of our resources at the scene of a missing child at Westport Lake in Stoke have been stood down for the night. We were initially called at 4.48pm on Monday afternoon after reports of a child getting into difficulty in the lake; two other youngsters had got out unharmed. A large number of resources including ambulances, paramedic officers, the Hazardous Area Response Team, doctors and the Midlands Air Ambulance from Staffordshire were initially sent to the scene. Around 11pm, the search was, called off for the night. Friday 22nd June 2018 – 4.45pm – Claire Brown. A man has sadly died following a road traffic collision in Oswestry this afternoon. West Midlands Ambulance Service was called to reports of an RTC involving a car and a motorcycle on the A495 near Narrow Boat Inn, Whittington, Oswestry shortly after 1.00pm (Friday). Two ambulances and a paramedic officer were sent to the scene. A West Midlands Ambulance Service spokeswoman said: “When ambulance staff arrived they found bystanders administering CPR to the motorcyclist. Sadly, nothing could be done by ambulance staff to save the man, and he was confirmed dead on scene. “The driver and passenger from the car, a man and a woman, were assessed on scene and were found to have sustained minor injuries. Neither required hospital treatment and were discharged on scene. Monday 18th June 2018 – 4pm – Jamie Arrowsmith. 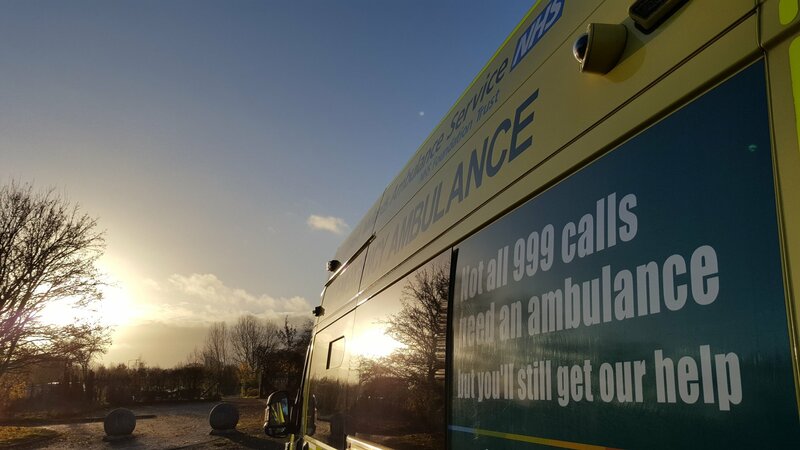 A collision between a car and a lorry on the M6 this afternoon left a man trapped for about an hour and requiring treatment from ambulance staff before being taken to hospital. 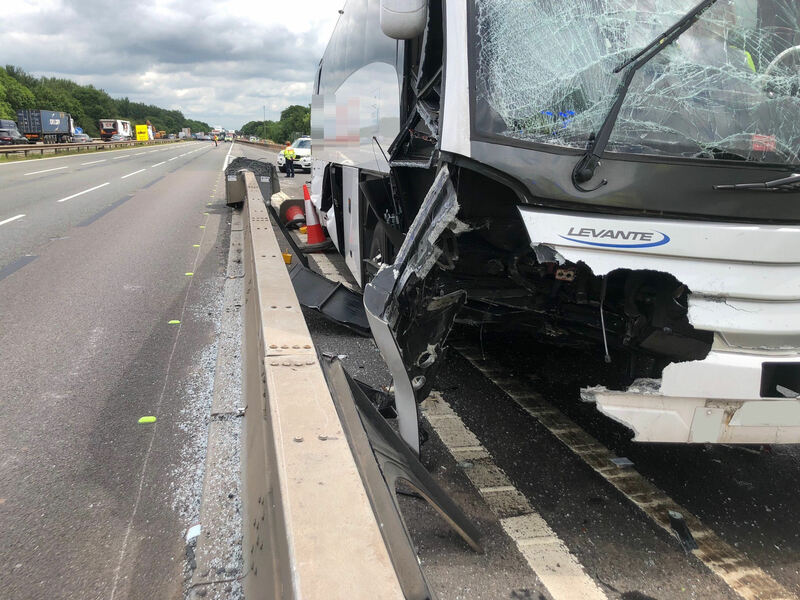 West Midlands Ambulance Service was called to the northbound carriage of the M6, near to junction 3A, at 1.30pm and sent one ambulance and the Warwickshire and Northamptonshire Air Ambulance to the scene. A West Midlands Ambulance Service spokesman said: “On arrival, crews discovered a car and lorry that had been involved in a collision. The car had subsequently also collided with the central reservation. “There was one patient, a man believed to be in his 40s who was trapped inside his car. “Ambulance staff assessed the man and monitored his condition throughout as the fire service worked to cut him free, a process that took approximately an hour. “Once out, the man, who was fully conscious throughout, was treated for neck, back and shoulder pain. He was immobilised and given pain relief and taken to University Hospital Coventry and Warwickshire by land ambulance. Monday 18th June 2018 – 3.30pm – Jamie Arrowsmith. A man had to be cut free through the roof of his car this afternoon following a three-vehicle collision that resulted in three people being taken to hospital. West Midlands Ambulance Service was called to Silkmore Lane in Stafford at 1.16pm and sent two ambulances, a paramedic officer and the Midlands Air Ambulance from Staffordshire to the scene. A West Midlands Ambulance Service spokesman said: “On arrival, crews discovered a van and two cars that had been involved in a collision with one of the cars having come to rest on its side. 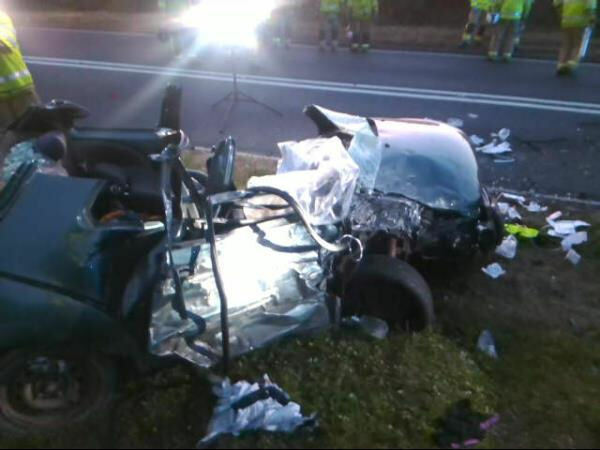 “The driver of that car, an elderly man, was trapped as a result of the damage caused to his vehicle. “Following an initial assessment from ambulance staff, the fire service worked to cut the man free with his condition continually being monitored throughout. He was trapped for approximately 20 minutes. “Thankfully the man appeared to have avoided serious injury in the incident but was treated for chest pain. He was then transported to Royal Stoke University Hospital for further assessment. Notes to Editors: If used, please credit the images to West Midlands Ambulance Service. Thursday 14th June 2018 – 8.35am – Jamie Arrowsmith. A man has died following a collision between a car and a motorbike last night (Wednesday). West Midlands Ambulance Service was called to the junction of Hall Green Road and Almond Tree Avenue in Coventry at 6.31pm. Two ambulances, a paramedic officer and the Warwickshire and Northamptonshire Air Ambulance Critical Care Car was sent to the scene. A West Midlands Ambulance Service spokesman said: “On arrival, crews discovered the motorcyclist, a man, in cardiac arrest following the collision. “Ambulance staff performed CPR and administered advanced life support but unfortunately it became apparent nothing could be done to save him and he was confirmed dead at the scene. Wednesday 13th June 2018 – 3.30pm – Claire Brown. One of the UKs most anticipated diversity awards celebrations has opened its nominations for the upcoming ceremony and the Trust’s LGBT Network is in the running for one of the awards. The Excellence in Diversity Awards will illustrate some of the nation’s most inclusive organisations at the ceremony on the 15th November in Manchester to honour those that lead in diversity, inclusion and fairness in all aspects of diversity. The Trust’s Proud@WMAS LGBT Network has been nominated in the ‘Outstanding Diversity Network’ category and, in order to be in with a chance of picking up the top prize we need your support! The judging panel will look for certain criteria for each award but there will also be a certain amount of merits based on the quantity and quality of supporting nominations received. If you think we should win and would like to support our nomination in the ‘Outstanding Diversity Network Award’, please visit http://www.excellenceindiversity.co.uk/outstanding-diversity-network-2/ and complete the form. Please use the nominee name ‘Proud@WMAS – West Midlands Ambulance Service’ and nominee email address ash.deakins@wmas.nhs.uk and don’t forget to include the reason why you are nominating us! Tuesday 12th June 2018 – 3.01pm – Murray MacGregor. 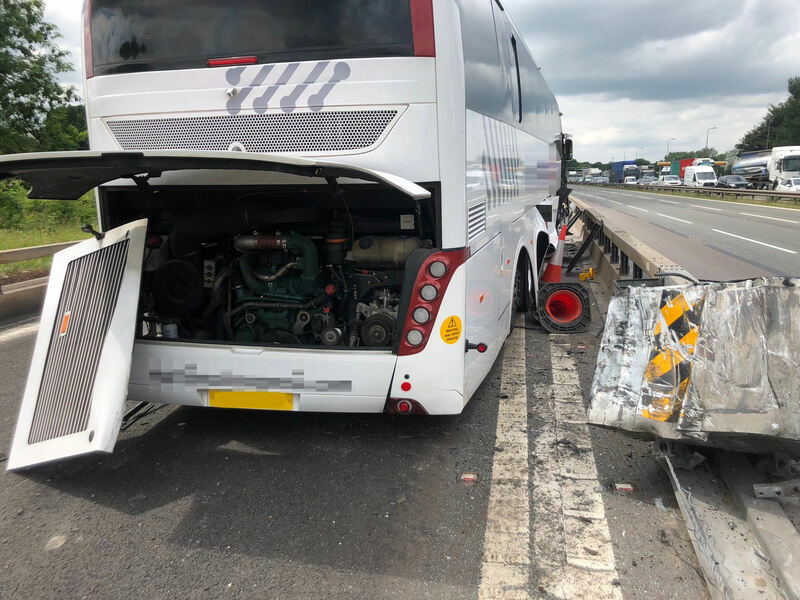 “The incident happened at entrance to the northbound Corley Services on the M6 motorway at just after 1.00pm today (Tuesday). An ambulance, a paramedic officer and the Warwickshire and Northamptonshire Air Ambulance were sent to the scene. 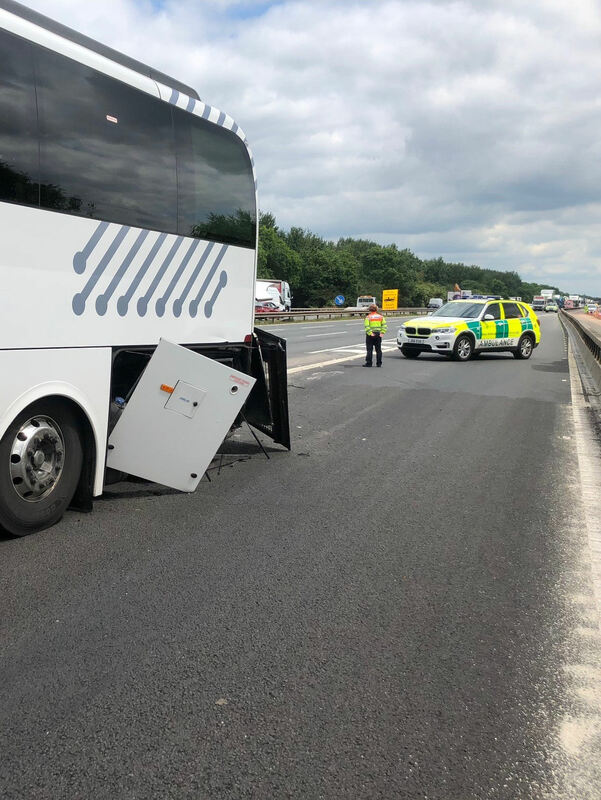 A West Midlands Ambulance Service spokesman said: “On arrival, crews found a single decker coach that had collided with a crash barrier at the entrance to the slip road. The coach had suffered significant damage. “The driver of the coach had suffered a head injury. He was taken to University Hospital Coventry & Warwickshire for further assessment and treatment along with a middle-aged man who had been in the front row of seats who was complaining of a chest injury. “A total of 37 other passengers were assessed at the scene but were uninjured. They were provided with advice and taken into the service station for safety while a replacement coach was brought to the scene. Monday 11th June 2018 – 11.0am – Claire Brown. A cyclist needed advanced trauma care after being involved in a serious RTC in Birmingham last night. West Midlands Ambulance Service was called to Bordesley Green East, Bordesley Green, Birmingham at 10.40pm yesterday (Sunday). Two ambulances, a paramedic officer and a MERIT trauma doctor attended the scene. The Trust’s Recruitment Team were the proud recipients of the winning trophy at a prestigious HR awards ceremony in London last night (Thursday 7th June). Tuesday 5th June 2018 – 11.15am – Jamie Arrowsmith. A man has died following a two-car road traffic collision in the early hours of this morning. West Midlands Ambulance Service was called to the junction of Station Street West and Foleshill Road, Coventry, shortly after 2.20am and sent two ambulances and a paramedic officer to the scene. A West Midlands Ambulance Service spokesman said: “Crews arrived to find a man in cardiac arrest with a bystander already performing CPR. Monday 4th June 2016 – 4.30pm – Jamie Arrowsmith. Two of the region’s Community First Responder (CFR) groups have received the most prestigious award a voluntary organisation can get. 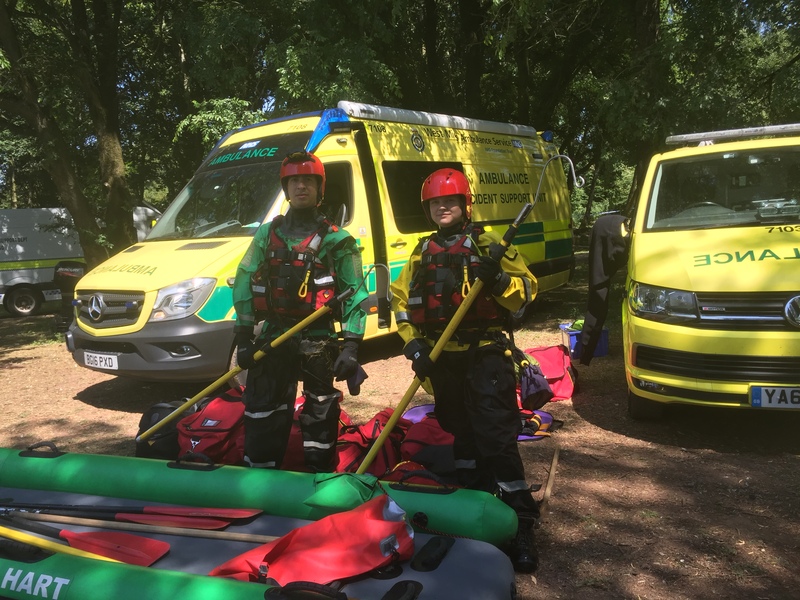 Rugeley and District CFRs and Burntwood and Cannock Chase CFRs have been recognised with the Queen’s Award for Voluntary Service for 2018 for providing emergency medical aid, training and lifesaving equipment to those living and working in their local community. CFRs are members of the public from all walks of life who give up their spare time to help make a difference in their communities. They offer an invaluable service by way of helping to reach those people suffering from medical emergencies in the remote rural communities, prior to the arrival of an ambulance. For many illnesses or injuries, the first few minutes are critical and simple interventions can be performed in order to save lives or prevent disability. As well as providing care for people in their local area, the CFRs also spend a considerable amount of time teaching other people vital first aid and life-saving skills. WMAS Chief Executive, Anthony Marsh said: “To see the two CFR groups recognised in this way is absolutely fantastic and thoroughly well-deserved. I am extremely proud of both of them. Both CFR Groups are set to receive their awards from the Lord Lieutenant later this year. For more information about the groups, to make a donation or find out more about joining them, please go to: http://www.burntwoodcfr.org.uk and www.radcfr.com. Burntwood – Group Co-Ordinator, Dan Walsh, and Treasurer, Eddie Malpass, are pictured at the Queen’s Garden Party at Buckingham Palace last week. Rugeley – Rugeley and District CFRs. Friday 1st June 2018 – 9.25am – Jamie Arrowsmith. 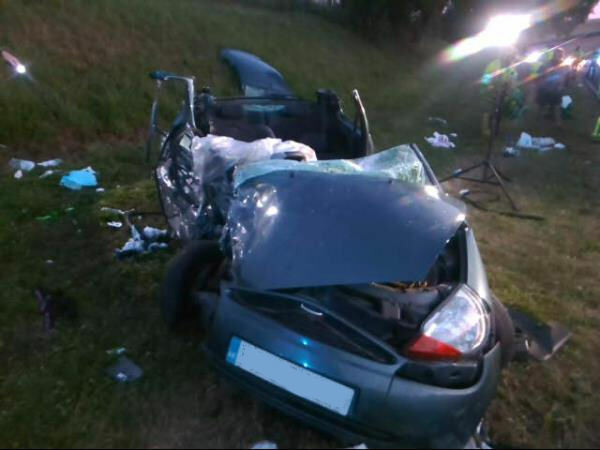 A boy has died and two further patients have been taken to hospital following a collision between a car and a lorry on the M6 last night (Thursday). West Midlands Ambulance Service was called to the incident between junctions 6 and 5 on the southbound carriageway at 7.37pm and sent two ambulances, a paramedic officer and a MERIT trauma doctor to the scene. A West Midlands Ambulance Service spokesman said: “Crews arrived to find three patients, all of whom had been travelling in the car. “The boy was found to be in cardiac arrest and ambulance staff immediately began CPR. “Unfortunately, it quickly became apparent nothing could be done to save him and he was confirmed dead at the scene. “A man, believed to be in his 60s, was treated for a suspected fractured shoulder and a woman, believed to be in her 20s, was treated for a leg injury. They were both taken to Heartlands Hospital in the same ambulance.